Warning: Pangs of hunger might occur. Viewers are advised to have a snack in hand as they read below. As I combed through Frank R. Steed’s scrapbooks, I came across a number of menus that he had collected while serving his country in WWI France. Since the menus were in French, I decided to translate and transcribe them so that they can be read and interpreted by a wider audience. 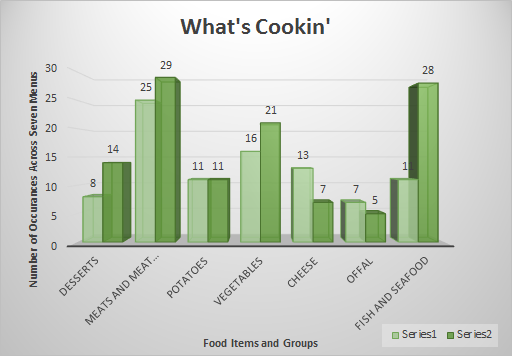 In addition to the translation and transcriptions, the menu data from his collection helps one to further explore the relationship between restaurant options in both America and France during and after WWI. In “Save a loaf a week, help win the War”: Food Conservation and World War I, I explored food production and food conservation in WWI America in relation to the distribution of these foodstuffs in WWI Europe. I wanted to take this food study a step further: By studying these menus one could better understand how Steed remembered his dining experiences during WWI. However, it is unclear whether Steed collected these menus because he had dined at these places, for their aesthetic value, or for some other purpose. One could argue that even though Steed might have not actually eaten at these restaurants, he nevertheless chose to keep these menus to remember part of his life in WWI France. 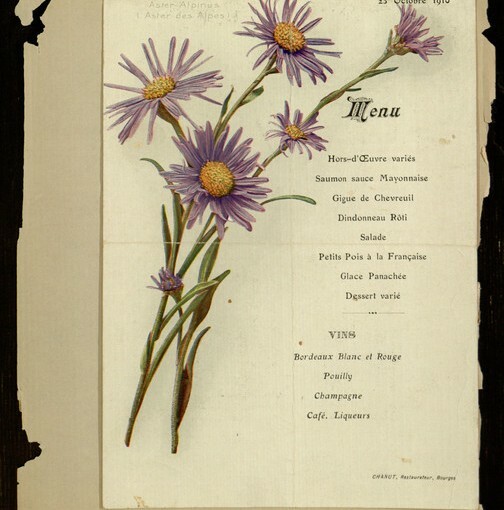 Gathering data from menus in the New York Public Library’s online collection can provide context and information for making comparisons and connections between dining options available in both WWI American and France. It is clear that food conservation efforts in the U.S. were encouraged to win the war in Europe. Americans were discouraged to eat certain foods so that it could be sent overseas to soldiers and allies. This begs the question: Were people in France eating more of the foods that Americans were forced to conserve or give up altogether? For instance, the poster below encouraged Americans to eat less wheat, sugar, fats, and meat, causing one to wonder if people in France were mainly eating these food items that were sent over by there American allies. Perhaps this is an avenue of research one could pursue by contextualizing the menus to find out if the restaurants and hotels were still serving these dishes in the midst of a food crisis and World War. In addition to households, the “Food Will Win the War” campaign also encouraged restaurants and hotels to conserve and serve certain foods. With the help of Dr. Seth Whidden, a French Professor at Villanova, we translated and studied seven menus in Steed’s scrapbooks, organizing most of the items on the menus into seven categories (each one is represented on the Excel graph above). 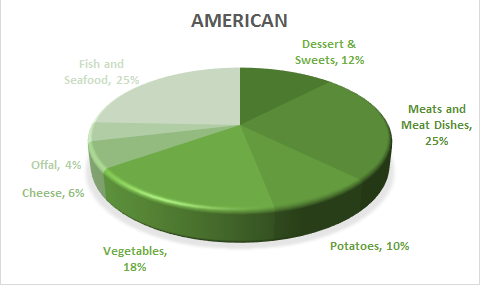 These seven categories—meat and meat dishes, fish and seafood, potatoes, cheese, vegetables, desserts, and offal—are the most important because the U.S. government encouraged citizens to eat less beef and more fish, seafood, or offal and to cut back on using sugar and fats so those items could be sent overseas. As mentioned above, there is potential for researching and finding interesting patterns in the availability of these foods in both France and America. In addition to the data from Steed’s scrapbook, there is very similar data included from menus held in the New York Library’s “What’s on the Menu” online archive that had similar dining options and were mostly all from hotel establishments like the menus in Steed’s collection. Initially one might think the meat options would be scarce on both the American and French menus, but it seems as though they appeared about the same number of times in each set (not too far behind the number of fish dishes). However, the number of fish and seafood dishes on the American menus is almost triple the amount on the French menus. Most importantly, the translation/transcription project makes the menus in Steed’s scrapbook more accessible to viewers. The scrapbook volumes as a whole are a rich resource for studying the life of an otherwise obscure person. Steed’s travels and the ways in which he chose to preserve and curate his experience embody the cultural, social, and political climate of his time, allowing historians to use ephemera that we nowadays take for granted–theater tickets, photos, postcards, menus–to ask new research questions about people living, working and fighting during WWI. The counted meat dishes include pork, beef, veal, and fowl, and the fish and seafood dishes include fish entrees along with lobster, clams, oysters, and shrimp. Offal dishes include tongue, liver, and tripe dishes. The vegetable category includes individual vegetables that were listed, such as an order of peas or an order of beets, but also vegetable items that were served with a main dish like a steak or fish. The dessert category includes pastries, ice cream, custards, and pies. On some menus, the word dessert was counted as one even though it implies that there was most likely a variety of desserts available but not listed on the menu. Pictured below is a menu from the Biltmore Hotel, a member of the United States Food Administration. “Hotel Pennsylvania,” New York Public Library. “Hotel Chamberlin,” New York Public Library. “The Biltmore,” New York Public Library. “Hotel Dyckman,” New York Public Library.